The 23rd BASIC (Brazil, South Africa, China and India) Ministerial Meeting on Climate Change was held on October 17 on the sidelines of the pre-COP Ministerial meetings scheduled for October 18 and 19 in Marakkech. At the BASIC meet, India’s Minister of Environment, Forest and Climate Change, Anil Madhav Dave, met his South African counterpart, Edna Molewa, Special Representative for Climate Change of China, Xie Zhenhua, and Under Secretary-General for the Environment, Energy, Science and Technology, Ministry of Foreign Affairs of Brazil, Antonio Marcondes, to discuss the role of developing nations in climate change negotiations and actions regarding the same. The meeting was observed by Salaheddine Mezouar, Minister of Foreign Affairs and Cooperation of Morocco and incoming President of COP22/CMP12/CMA1 and Ambassador Wael Abou El Magd, Deputy Minister of Foreign Affairs for Environment and Sustainable Development of Egypt, on behalf of the chair of the African Ministerial Conference of the Environment (AMCEN). The meeting was concluded with a joint statement that “emphasised the importance of the Marrakesh Climate Change Conference as an important step in the process of implementation of the Paris Agreement and as another milestone to accelerate pre-2020 implementation”. The Paris Agreement is due to enter into force on November 4 and the first meeting of the parties to the agreement (CMA 1) will also be held during the COP 22 in November in Morocco. The BASIC ministers reiterated in the joint statement “that developed countries should provide financial resources, technology development and transfer and capacity-building support to developing countries for their effective implementation and ambitious actions under the Paris Agreement”. Further, the ministers expressed hope that the terms of reference for the Paris Committee on Capacity-Building, agreed by all Parties at the May 2016 session of the UNFCCC in Bonn, will be adopted at COP22. 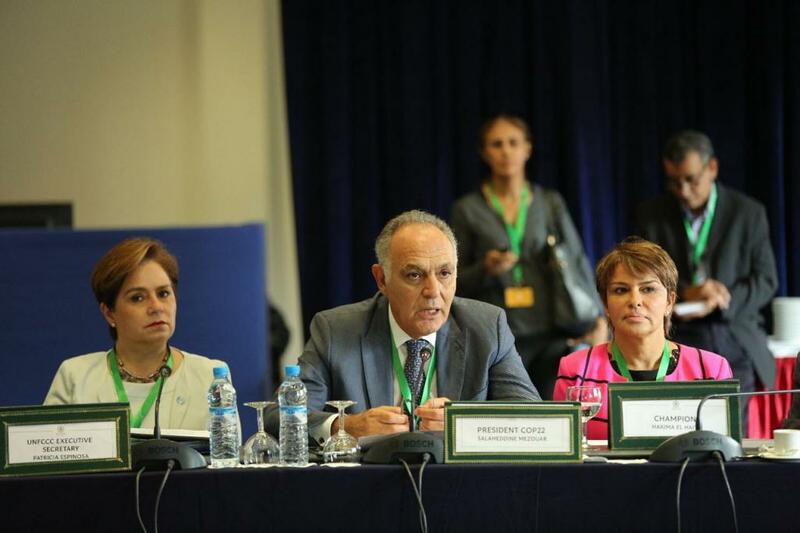 The other meeting held on the margins of the pre-COP meeting was the Civil Society Dialogue jointly chaired by Salaheddine Mezouar and Patricia Espinosa— UNFCCC Executive Secretary. It was announced that the Moroccan Presidency will meet with civil society during COP22 to take stock and come together around a common climate agenda.